You want to read the Bible to your toddler, preschooler, or early elementary age child but you run into this dilema: What Bible should I use? First, you have to decide if you're ok with a story Bible or if you want a true translation. What's the difference? A children's story Bible is just that – the stories. It's not scripture translated word by word or thought for thought. It's the basic facts from the stories. A translation is what you might call a traditional adult Bible – the words have been translated directly from Hebrew and Greek texts. Why does it matter? I'm not against children's story Bibles and in fact have used several different children's story Bibles with my boys. If you use one, you need to make sure that you and your child understand that it is not scripture. It's contains the basic facts and ideas from stories in the Bible, but it's not word for word and they leave out large chunks of the Bible. Once you're clear on that, which Bible should you use? Printed by a reputable publisher. It's easy to take liberties with the story and you want to make sure that incorrect theology is not inserted into the stories. Going with a publisher that you know and trust will help. Contains excellent graphics. You're competing with videos and games. Get something high quality. Don't skimp. Contain stories from as much of the Bible as possible. It's hard to fit the letter to the Hebrews into a children's story Bible. I concede on that point, but the point is that you want to expose your child to as much of the Bible as possible. The Beginner's Bible – This Bible is published by Zondervan, a reputable Christian publishing company. The graphics are great. The print is large and there are short paragraphs on each page. This children's story Bible is great for toddlers and preschoolers. It has a reading level of around 1st grade, making it a great Bible for your child as they are learning to read as well. Egermeier's Bible Story Book – This Bible is part of our Sonlight Core A curriculum. I was happy to see that it was published by Warner Press, the publishing company of the Church of God, Anderson. I'm an Anderson University graduate so I felt comfortable using this children's story Bible. This one is for slight older kids – late preschool to elementary. The stories are long and detailed. It's about as close as you can get to a traditional Bible and still be a children's story Bible. 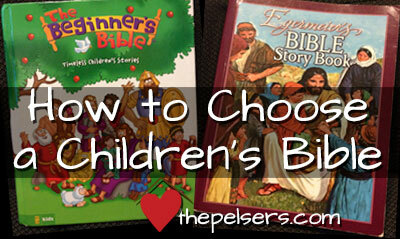 What if you want a “real” Bible from the beginning or your child is ready to step up to a traditional Bible? You know your child and your family. You may already have a preferred translation. Go with it. Kids understand more at an earlier age than we give them credit for most of the time. Plus, you're building a foundation and a framework; you shouldn't be expecting your kids to retain everything all at once. They'll fill in the blanks as they get older and learn more. Our preferred family translation is usually the ESV. I like the wooden, literal translations. Since starting Grapevine Studies with Jonathan, I usually read the NIV to him. The NIV is designed to read a little more fluidly and the vocabulary choices are a little easier for him to understand in most cases. His Child Training Bible was made using an NIV study bible. 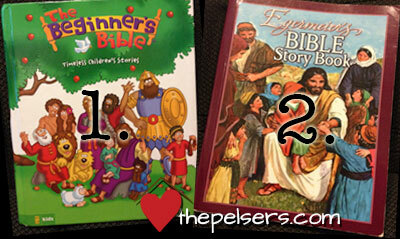 What do you think of children's story Bibles? Got a favorite you'd like to share? Leave a comment! How have you kept your kids in the word this week? Share in the comments or link up a blog post. Anything relating to kids and the Bible, character, worldview, etc is welcome for linking! Please grab the button from the side bar and use it in your post. We love the Jesus storybook bible for our littles. I love how all of the stories explicitly point out for the kiddos that even the ot stories point tothe coming savior – Jesus. It is such a beautifully put together bible. Our 8 year old uses the day by day bible for kids. We like it because it breaks the bible up into nice size chunks for daily devotions and isn’t too overwhelming. I think I’ll have to look into that one for my 5 year old. Exactly! We can’t be lazy parents. It’s our responsibility to be active in discipling our kids. We love the Children’s Illustrated Bible by Selina Hastings. It’s got great illustrations and contextual facts and maps in it. We also like 100 Bible Stories and 100 Bible Heroes wth the fun CDs just for story time. But we also make sure to point out that anything other than their KJV Bible is just a “bible storybook.” “THE Bible” means their KJV. I also agree that you shouldn’t feel like your kids can’t handle the adult translations of the bible. I felt overwhelmed at first when we decided that the KJV would be our family’s standard (it’s our church’s standard as well). I came from an NIV tradition. But you have to TEACH them the bible regardless of what translation you use, so don’t be afraid to just dive in. Our kids amaze me daily with how much they are able to understand and retain. God created our kids with a desire to know him. We have to take advantage of that before it gets lost in this world. We love the Jesus Storybook Bible, it’s been a great addition to our home. Great post! We use A Child’s First Bible by Kenneth Taylor and my girls LOVE to read the Bible stories.